Mishima’s culture has been inherited from the Warring States period(about 500 years ago). Local music played at the festivals in Mishima City,such as the annual festivals at Mishima Taisha Shrine. 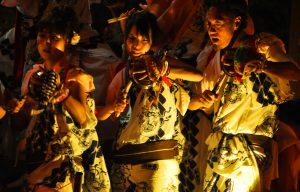 The music is played in good rhythm with traditional Japanese instruments;surigane(metal percussion),drums,and flutes. At the Mishima Oomatsuri,you can watch a crawl where you play a Mishima music accompanied by a festive floats.